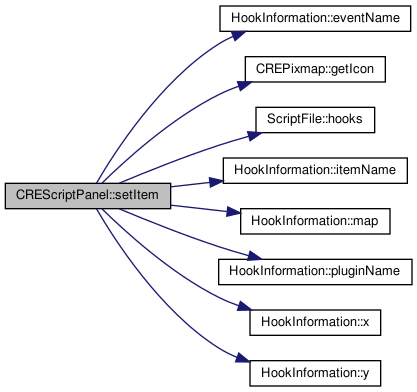 Definition at line 9 of file CREScriptPanel.h. Definition at line 30 of file CREScriptPanel.cpp. Definition at line 42 of file CREScriptPanel.cpp. References HookInformation::eventName(), events, CREPixmap::getIcon(), ScriptFile::hooks(), HookInformation::itemName(), HookInformation::map(), myMaps, CREMapInformation::path, HookInformation::pluginName(), HookInformation::x(), and HookInformation::y(). Definition at line 17 of file CREScriptPanel.h. Referenced by CREScriptPanel(), and setItem().